Who doesnt like lava cake???? If you dont, then there is something not normal in you, sorry! Melt the chocolates and butter in the microwave, or in a double boiler. Add the flour and sugar to chocolate mixture. Stir in the eggs and yolks until smooth. Add vanilla and stir. Divide the batter evenly among the ramekins. Place in the oven and bake for 14 minutes. The edges should be firm but the center will be runny. Run a knife around the edges to loosen and invert onto dessert plates. 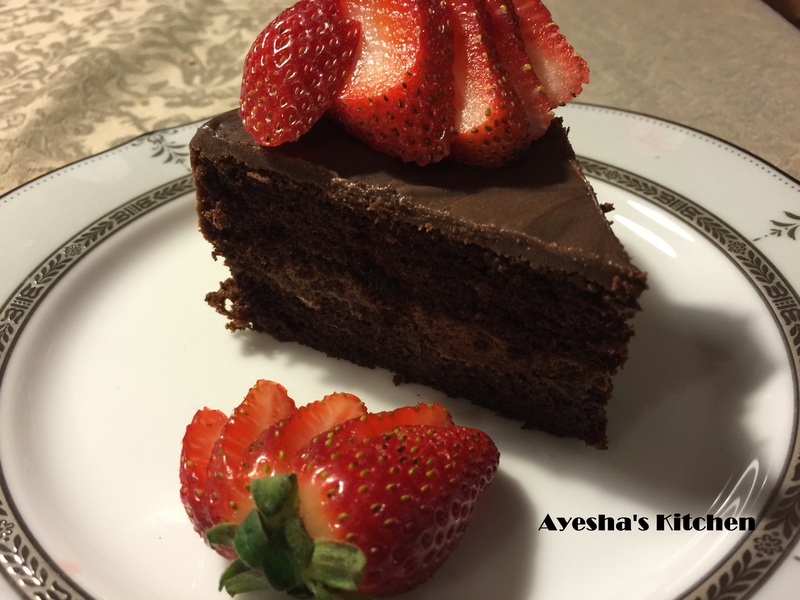 A very easy and quick recipe to enjoy your favorite Chocolate cake at home….. Perfect for Valentines’ Day, Birthdays and special dinners…..
-Preheat your oven to 180 degrees C .Butter and flour an 9-inch cake pan. -Separate the eggs, placing the whites in one bowl and the yolks in another. To the whites, add the additional egg white and then cover both bowls with plastic wrap. -Meanwhile whisk or sift together the flour, cocoa powder, baking powder, baking soda, and salt. -In a liquid measuring cup, whisk together the oil, coffee or water, and vanilla extract. -In the bowl of your electric mixer (or with a hand mixer or wire whisk) beat the egg yolks with 2/3 cup (135 grams) of the sugar. Turn the mixer on low speed and slowly pour the oil mixture into the egg yolks and beat until well combined. Gradually add the flour mixture and beat until well incorporated. -In a separate mixing bowl, fitted with the whisk attachment (or with a hand mixer), beat the egg whites and cream of tartar until soft peaks form. Gradually beat in the remaining 1/3 cup (65 grams) of sugar and beat until stiff peaks form. With a rubber spatula or wire whisk, gently fold the egg whites into the batter (in three stages) just until blended (being careful not to deflate the batter). -Pour the batter into the prepared pan and bake for about 35 – 40 minutes, or until a wooden skewer inserted into the center of the cake comes out clean. (When lightly pressed the cake will spring back). Cool on a wire rack for about 15 minutes. To remove the cake from the pan, run a spatula around the inside of the pan to loosen the cake. Invert onto a wire rack. – In a large mixing bowl combine all the ingredients. Then beat the mixture until stiff peaks form. -Once the cake has cooled completely, place on a flat surface and, using a sharp knife, cut the cake, horizontally, into two layers. Turn over the top layer of the cake (so the top of the cake becomes the bottom) and spread with the chocolate whipped cream. Place the second layer of cake, cut-side down, on top of the chocolate cream, gently pressing to compact. Cover with plastic wrap and place the cake in the refrigerator for several hours, or even overnight, before covering with the ganache. -Place the finely chopped chocolate in a medium sized heatproof bowl. Heat the cream and butter in a small saucepan over medium heat. Bring just to a boil. Then immediately pour the boiling cream over the chocolate and allow to stand for a few minutes so the chocolate melts. Gently stir until smooth. Add the liqueur, if using, and let cool for about 10 minutes. -Let the cake set a little on the wire rack and then gently transfer the cake to your serving platter and place the cake in the refrigerator until serving time. 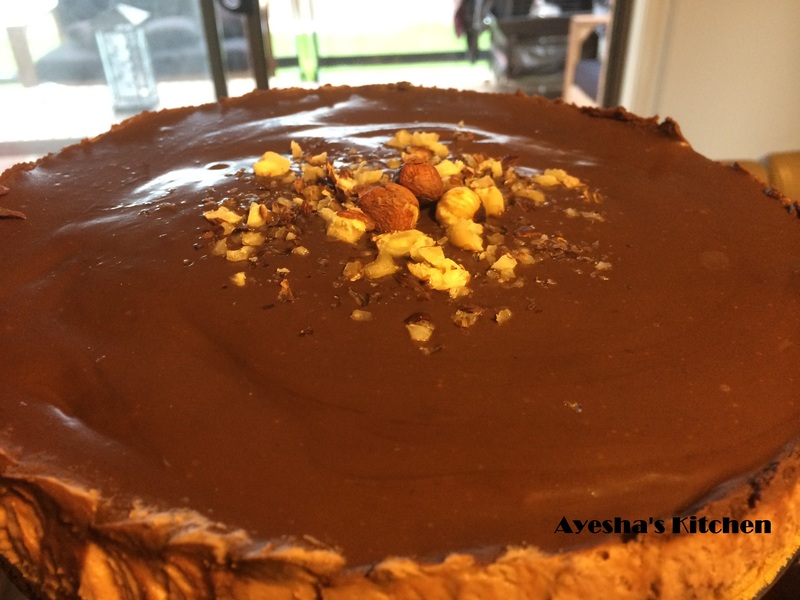 This cake can be made a day or two before serving. You can decorate the top of the cake with the chocolate truffles or fresh raspberries or strawberries, if desired. Today we are making a cake that is not only popular in Morocco but also in Europe and in the U.S.: Marble Cake! 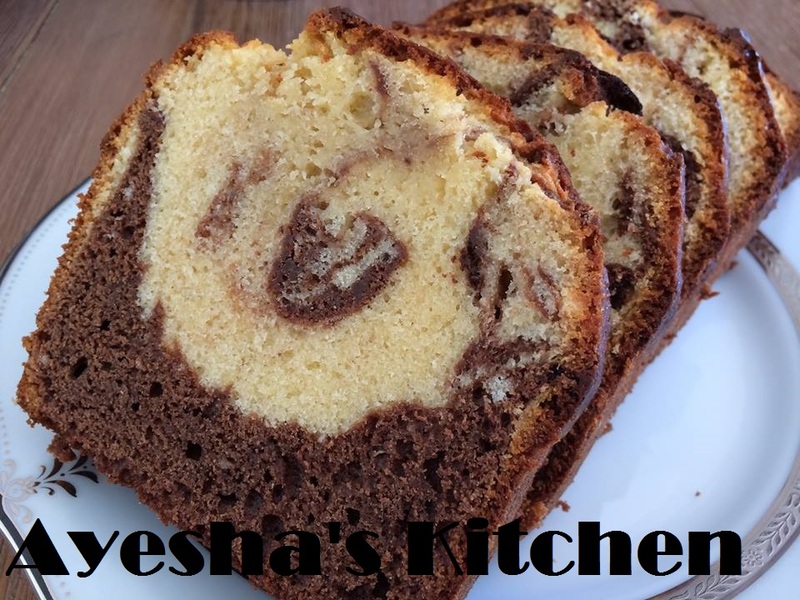 It is a cake with vanilla and chocolate mixed together in a swirl! It’s super easy and super delicious! -The first step is to beat the 5 eggs with the sugar, using an egg beater. You want the eggs to become double in volume, fluffy, and have a withish color. This is an important step to make the cake moist! -The eggs are ready when they become very thick – you can actually create a ‘ribbon’ with the batter when you pour some of it with a spoon over the rest of the batter! -Add the vanilla extract, a pinch of salt, and the baking powder to the egg mixture. Continue mixing for a few seconds until well incorporated. -Melt the butter (either in the microwave or in a sauce pan). -Add the melted butter to the egg mixture while continuously stirring. -Sift the flour over the egg mixture and gently fold all the ingredients together using a spatula, until well incorporated. -Split the batter, equally, into 2 separate bowls. In one portion we are going to add melted dark chocolate, and the other one melted white chocolate. If you dont like white chocolate you can skip it, or you can replace the dark chocolate with cocoa powder. You can even create your own flavors, for example, strawberry and chocolate, or green tea and white chocolate! -Melt the dark chocolate and white chocolate separately. -Preheat your oven to 180 C.
-Add the melted dark chocolate to one portion of the batter. Then add the melted white chocolate to the other portion of the batter. Mix well. -Butter your cake mold, then place parchment paper in it (I am using an 8″ rectangular cake pan). The reason we need to butter the pan before the parchment paper is to get the paper to stick to the pan, otherwise, the paper will not stick! Cut the border of the parchment paper with scissors to get even borders. -First pour half of the white chocolate batter in the pan. Then cover it with the entire dark chocolate batter, use a spatula to spread evenly. Finally pour the rest of the white chocolate batter on top of the chocolate batter. -Bake the cake for around 45 minutes or until it is done. It will become golden brown, and when you press the top of the cake it feels firm. -Remove the cake from the pan and let it cool down. -Slice it and serve with tea. Match Made In Food Heaven! -Grease a 22cm spring form pan. -Crush the graham crackers and put them in a mixing bowl. Add hazelnut meal and melted butter and mix until it gets wet sand like texture. -Put the graham cracker mixture in the pan and press to make an even base. Stick it in the freezer until we make the filling. -Now for filling make sure everything is at the room temperature except the cream. It has to be chilled otherwise it won’t whip properly and the cake will be dense. -So let’s get started….. In a mixing bowl whip cream cheese with and electric mixture until it is smooth. Now add rest of the ingredients except hazelnuts. Give another whip and mix everything. -Gently fold in the chopped hazelnuts and pour the mixture in the spring form pan over the graham cracker base and cover it with cling film. Refrigerate for at least 16 hours. -Now microwave some cream for 1 minute and pour over the semisweet chocolate chips to make the ganache. Keep it aside for 2 minutes without touching it. The heat from the cream will help us in melting the chocolate. -Now add butter (gives shine and gloss to the ganache) and start whisking it until it turns into a shiny chocolate mixture. Cool it for 2 minutes and then pour over the cheesecake which is still in the spring form pan. -Refrigerate for a couple of hours, let ganache set for a while. Now decorate it with anything you want, hazelnuts, confectioner sugar, whipped cream, etc. and serve. 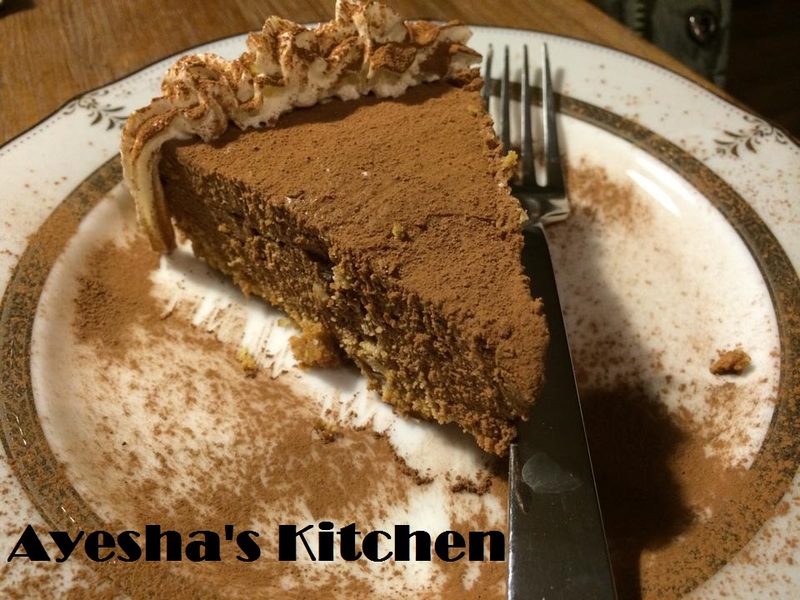 So I made chocolate caramel cheesecake last week, it was really sweet so this week I decided to make something with chocolate but with a hint of bitterness….. so what can be better than Mocha Cheesecake? You will love it, give it a try and enjoy it with your family& friends……. -Crush digestives in a food processor and mix coconut and sugar with it. Now add melted butter and mix until it looks like wet sand. -Take a 22inch springform pan and spray some non stick spray on it. -Lay a base of this digestive biscuit mix and make it even with your fingers. -Stick it in the freezer for around 10 minutes. -Meanwhile lets make our cream cheese filling. -Melt the chocolate in a microwave proof bowl for heating it for 2 minutes and let it stay in the microwave until needed. -Now in a large mixing bowl combine everything except chocolate, chocolate chips and cream and coffee mixture. -Using an electric hand mixer mix everything together until just combined. Scrape the sides of the bowl with the spatula and mix again. -Now mix coffee granules with the cream. Stir well until they are dissolved in the cold cream. -Now introduce it to the cream cheese mixture along with the melted chocolate. Give your beater another buzz and mix everything together for about 2 minutes on high speed. This will make the cheesecake fluffy as well. -Now mix it the chocolate chips and pour this mixture onto your base and make it smooth and even with the spatula. Cover it with cling film and refrigerate for atleast 16 hours. 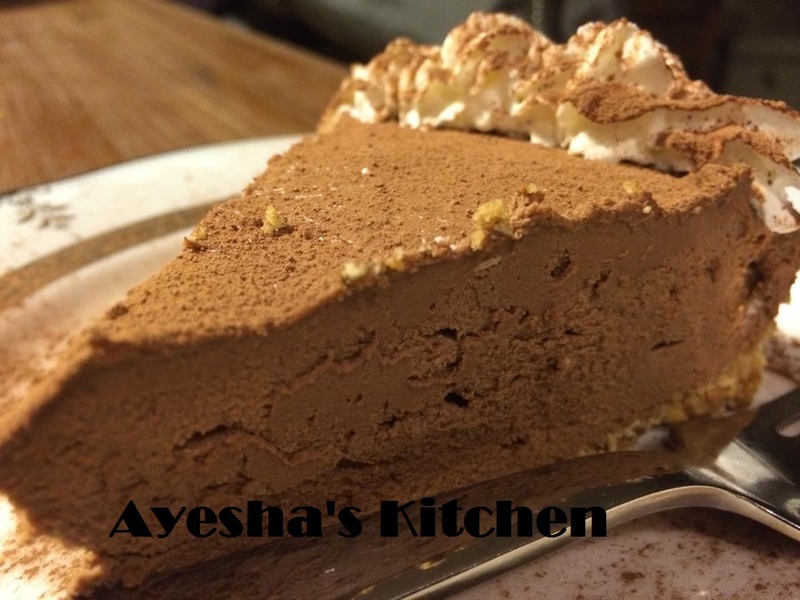 -Take it out, decorate with some whipped cream, top it with some cocoa powder, cut a slice and serve. Chocolate Caramel Cheesecake…… Chocolate Caramel Cheesecake……. 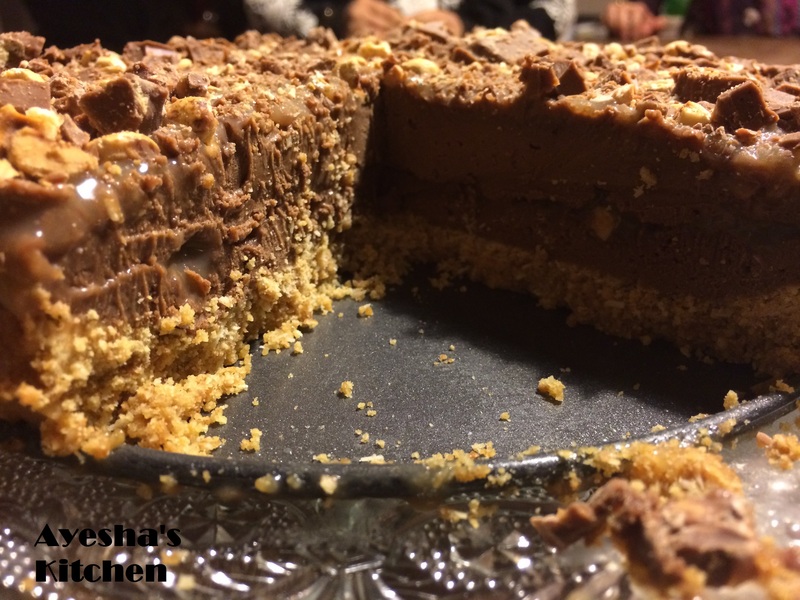 Chocolate Caramel Cheesecake…… Chocolate Caramel Cheesecake ….. I cant think of anything else when I have this in front of me. Lets make it! -Preheat your oven to 180 degrees celsius. -In a food processor, crush the graham crackers. Put them in a bowl, mix some brown sugar and desiccated coconut. Pour melted butter and mix until it looks like wet sand. -Line it in the bottom of your 22cm spring form pan and with the tips of your fingers or back of the spoon press the crumbs to make an even base. -Bake for about 10 minutes and take it out. Turn off the oven because you don’t need it now (that’s the best part about this cake) Let it cool completely in the pan and please DO NOT open the spring form at this stage. -Meanwhile let us make our caramel sauce! -So for the caramel sauce, pour the water in the saucepan and add the sugar, DO NOT STIR! Put it on stove on medium heat until it starts to dissolve and change its colour to light Amber color. -Now you have to be very careful because we are about to introduce warm cream to our sugar mixture, in fact “Boiling” sugar mixture. -Take it off the stove, add cream little by little, stirring constantly with wooden spoon until the whole cream is in the saucepan. -Bring it back to the heat and add butter and salt. -Butter will reduce the bubbling of cream and sugar. 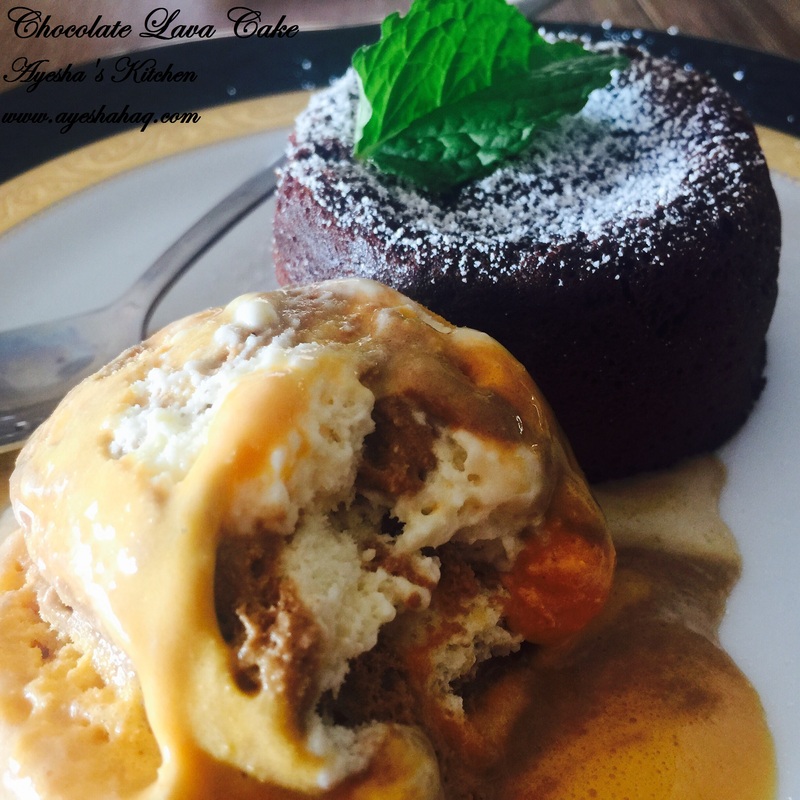 -Let it cook on low heat for 2 minutes and WOLLA……… your caramel sauce is ready. -Pour it in a bowl and put it in the freezer until we need it. (We want lukewarm but not frozen caramel). -While the caramel is resting and cooling itself down, lets make our cream cheese filling. -So for cream cheese filling, you need to take a big mixing bowl, put your cream cheese blocks which are obviously at room temperature, add salt, coffee and vanilla and mix it with your handy dandy electric mixture (which is also known as beater). Mix well until everything is combined. Now add lukewarm melted chocolate and mix again. -And congratulations! Your cream cheese filling is now done J . -Now chop chop your chocolate bar into small pieces but please do not crush them. We want chocolate chip size pieces. I could have used chocolate chips but I do not like the taste. I want my this treat to be EXTRAORDINARY!!!!!!!!!!! So I used caramel hazelnut lindt chocolate bar. It just adds the goodness…. I mean chocolate on top of chocolate and caramel…… !!!!! Yum! -Ok now, divide your cream cheese filling, caramel and chopped chocolate into 2 parts. 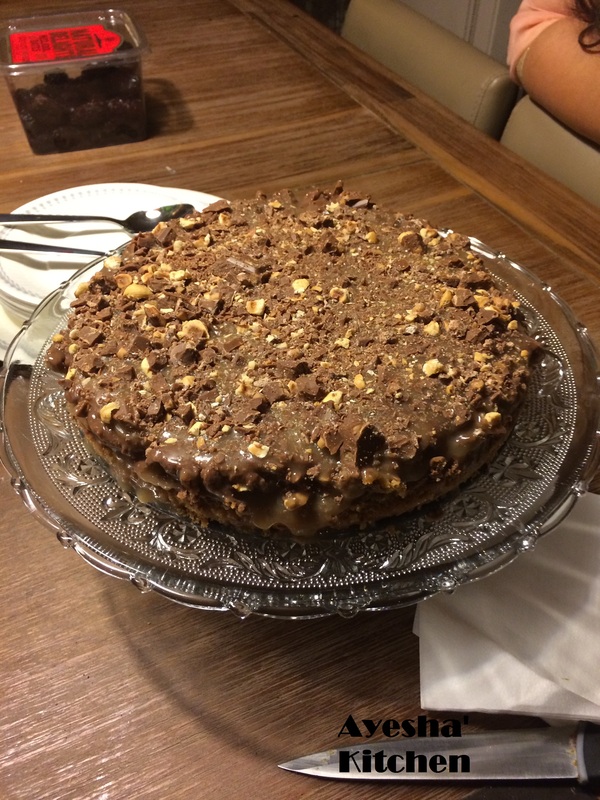 -Take your base which is still in the springform, lay a layer of chocolate cream cheese, make it smooth with the spoon or the spatula, drizzle some caramel, make it smooth as well and then put some chopped chocolate on top. -Then again, lay another layer of cream cheese filling, make it smooth, drizzle some caramel (this is your last layer as well as your final look to the cake so, be organised!) and put left over chocolate chunks on top in a decorative manner or just chuck that all on top. -Refrigerate for 16 – 18 hours or 24 hours (if you can wait that long) to let it set completely otherwise it is going to be a big mess. -Take it out and now finally you can open the spring form pan. Cut it into slices, it will be messy because we have caramel in there but that’s fine. -Cut it into slices and serve chilled to your guests.